Edmundston, NB (March 30, 2016)– Twin Rivers Paper Company is pleased to announce its contribution to the Edmundston Community Amphitheatre campaign, totalling $100,000. A key project for the vitality and future of the city, this donation will provide support for the construction of this important community space. 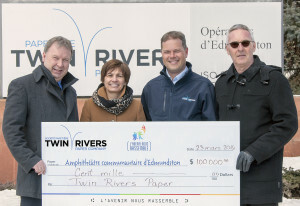 Paul Bérubé, campaign treasurer (left), and Rino Pelletier, major donations co-chair (right), receive a $100,000 Edmundston Community donation from Twin Rivers representatives Denise Pinette and Roland Leger (center). This $100,000 donation, makes Twin Rivers a Builder Sponsor, for the Edmundston Community Amphitheatre project.